Wanted Army War military, militaria, Medals and RAF Log Books souvenirs in Bristol area - Always wanted insignia, patches, war souvenir's, Paratroop, SAS, Royal Air Force, American and all Militaria. NEW CATEGORY - British Post War Para Insignia coming soon. Stands C2 and C3 - Hope to see you there, it's a great show. Please note to my customers, Dollar charges are slightly higher than you see in your basket when paying by Paypal. Your Paypal statement will show a higher amount. This due to PayPal's exchange rates for U.S.Dollar v British Pound. Sorry for this but it's not me setting the rates, I get the correct British pounds only. If you prefer you may pay by bank transfer but your bank may charge for international payments. Always looking for single items or whole collections of SAS, Paras, Special Forces, WWII RAF log books, RAF badges and medals, American Militaria, Air Corps, Glider Troopers. SOE items. WWII USAAF 8th and 9th Air Force items, medals, rank, English and American made wings, bullion patches, squadron patches. Also RAF, Commonwealth and USAAF Medals, Logs Books, Insignia, Wings, Flying Jackets and Military watches all periods. Pathfinders, Battle of Britain, also German items wanted. Wanted Military army war souvenirs and Militaria in Bristol. WWII British and American Special Forces, SAS, Paratroops, Glider Troops insignia, medals, Air Corp Crew Wings, Uniforms and Equipment. I have acquired a rare 1941 Ford GP Jeep for restoration. (Looks like being a moment of madness) Needs lots of parts and work. If you have any or know of any parts contacts please let me know. The body has now been rebuilt with the chassis, engine and transmission near completion. Latest news - Well Christmas came and went but Santa was not in a Jeep!!! Mean while the black hole gets bigger. Since operating on-line I have mailed items to Holland, Belgium, Norway, Sweden, Switzerland, Finland, France, Italy, Poland, Spain, Austria, Germany, Luxembourg, Denmark, U-S-A, Canada, Australia, New Zealand, Japan, Singapore, Czech Republic, Scotland, Wales, Ireland, Oman, Hong Kong, Hawaii and to a Granddad in Witney. United States Militaria - Air Corps, Airborne, Special Forces WWII through to Vietnam. 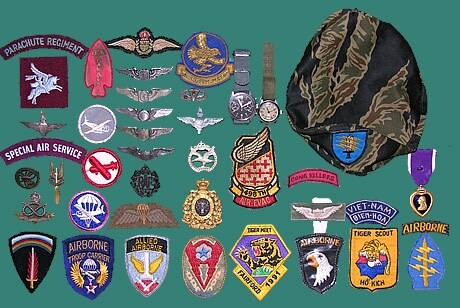 WWII British cap badges - Parachute Regiment, SAS and Royal Air Force. Always interested in buying/trading insignia, wings, uniforms, medal grouping, flying jackets, log books, military watches. Single items or collections. I will also consider consignment items. Please note high value items must be shipped insured please check costs before ordering. I offer a money back guarantee on all items. If you are not happy with your purchase I will refund your money less the mail and post charges.